I’ll admit that I’m not really a huge fan of monthly beauty boxes: they get a little repetitive and not that exciting, but I was so impressed when the new Spring Tili Beauty Box by QVC came in! Since it is only seasonal, it seems to be a little more substantial with some great QVC brands, which I don’t regularly see in other beauty boxes. Available online at QVCUK.com, this beauty box includes some of my favourite cult brands in very generous travel sizes. For £20 you get a carefully curated edit of skincare, makeup, nails, haircare, bath & body products which makes this box a must-have if you will be travelling at all this spring/summer. Let’s delve deeper into the box…. Exclusive to QVC, there is the Philip Kingsley Elasticizer 75ml in Coconut Breeze: a pre-shampoo treatment that super conditions hair whilst adding shine & bounce. This Coconut Breeze edition is an exotic coconut scent which really remind me of holiday and which I’ll be packing on my next beach adventure. There are two makeup offerings: the Mally Shadow Stick in Smoky Quartz and Dolly 10 Lip Velvet in Material Girl. Both brands are available on QVC but I actually haven’t ever tried anything from Dolly 10 before. I always get excited to try new brands and am really impressed by the Lip Velvet; I love the nudey colour, it has a mousse-like texture, which leaves the lips matte but still comfortable and not too harsh. I’ve tried a few things from Mally before and always been very impressed, this Shadow Stick is no different and it has already made it into my makeup bag. 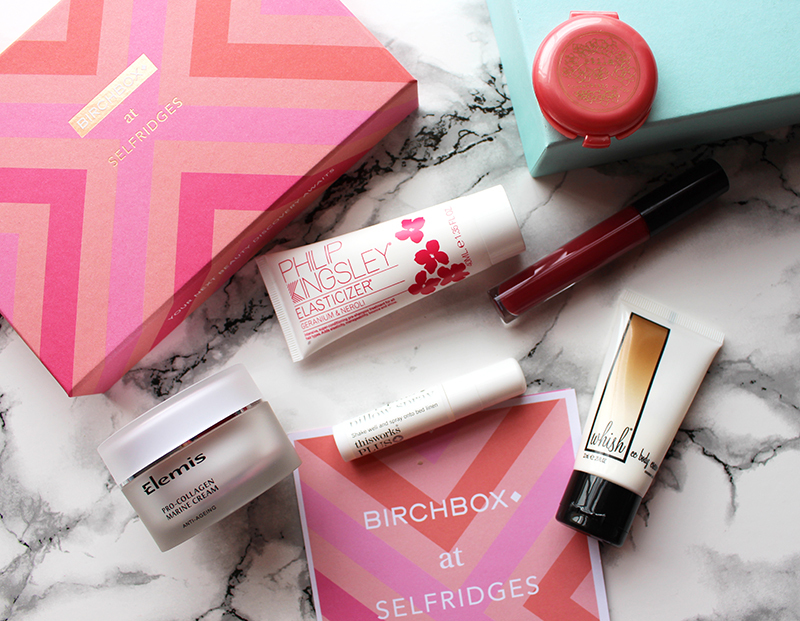 If skincare is more your thing then this box won’t disappoint as there are some must-have cult classics. There is a 15ml Pixi Glow Tonic; an exfoliating toner that helps perfect skin tone and texture as well as the This Works In Transit Camera Close Up – one of my favourite multi-purpose products: it’s a mask, moisturizer and primer all-in-one. Finally for skincare, there is a small Decleor Smoothing Oil Serum in Mandarin – which is a super serum that draws on Mandarin Essential Oil’s abilities to protect cells from Radical Damage; cleanses and detoxifies – as well as the Elemis Gentle Foaming Facial Wash to remove pollutants and impurities from the skin whilst maintaining the skins natural oils. Everyone always needs bath and shower gels and there are two offerings in this box: a 50ml Molton Brown one and an Australian Body Care Tea Tree Oil Skin Wash.
To add a final splash of colour to your spring, there is the much-loved Essie Mint Candy Apple, the perfect crème mint shade. 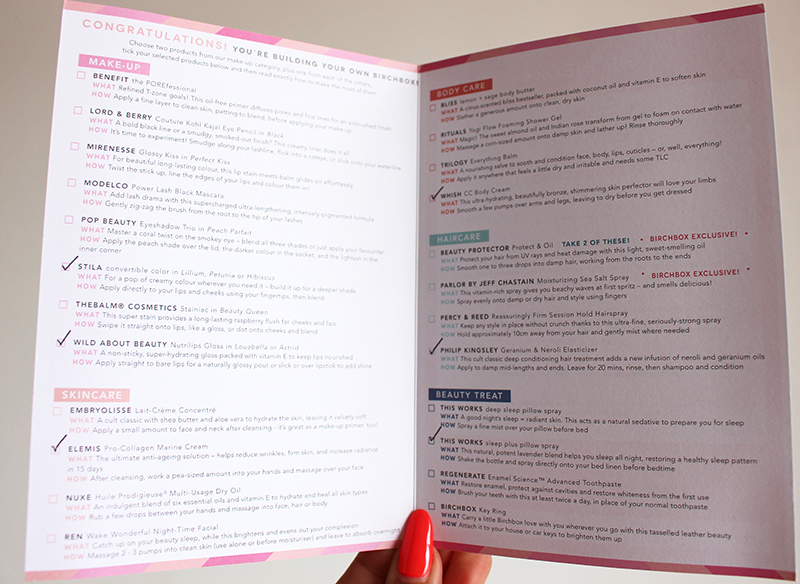 Overall, I think this is an impressive box for any beauty junkie and I wasn’t disappointed in a single product – which has gotten particularly rare in beauty boxes. Since receiving this box, I have found myself reaching for its contents on a daily basis. When John Lewis asked me to try some of the products from InStyle Magazine’s Best Beauty Buy’s 2015 of course I said yes. 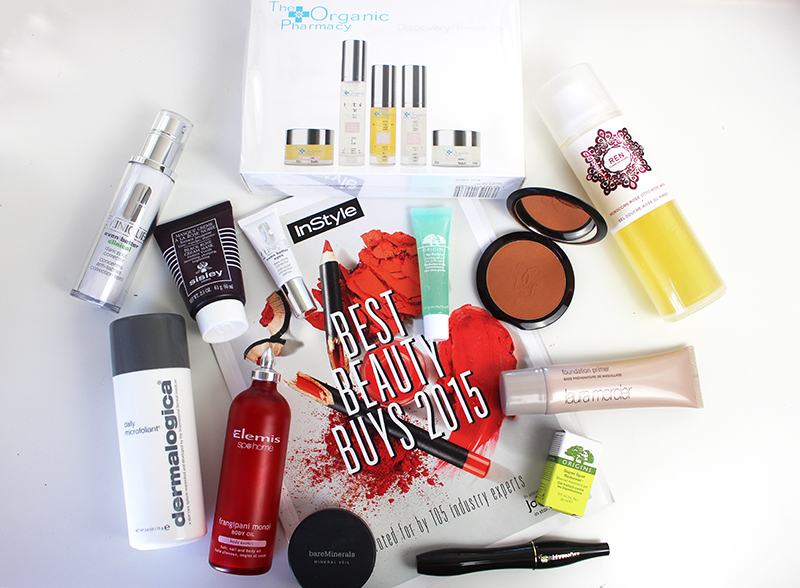 They have compiled a list of 103 beauty products, voted for by 105 beauty experts. There are some real skincare treats in the list, including the Sisley Black Rose Cream Mask which won Best Hydrating Mask and which I am most excited to try- partly because it’s worth a whopping £95.50, so it must be good to be considered worth the money. Unsurprisingly Origins also won best Spot Treatment with Origins Super Spot Remover Blemish Treatment which I would agree is the best and I am excited to also try the Origins No Puffery Cooling Roll-On For Puffy Eyes which won Best Eye De-Puffer. It has a metal roller ball which helps instantly cool the eye area and deflates puffy eyes. Another product I have heard great things about but haven’t yet had a chance to try is the Clinique Even Better Clinical Dark Spot Corrector which although won Best Age-Spot Treatment apparently works wonders on acne scarring too. Also from Clinique and winner of Best For Dark Circles is the Clinique Even Better Eyes Dark Circle Corrector which I find really does lighten the under eye area but is still very light and cooling. A product which has recently entered my wishlist and which I’m sure I will be talking about more soon is the Dermalogica Daily Microfoliant which won Best Facial Exfoliator and is unlike any other I have tried, as it is a fine powder texture and has actually won this category 11 times. I haven’t tried much from Organic ranges so I’m excited to give The Organics Pharmacy a try as it won Best Eco/Organic Range and starts at just £3.95. In the Bath & Body category the winner of Best Body Oil is Elemis Frangipani Monoi Body Oil which comes in the most beautiful bottle and can apparently be used on anything from your hair to cuticles. Winner of Best Shower Gel is Ren Moroccan Rose Otto Body Wash which I’ve used in the past; it has a beautiful scent and feels like very luxurious. Winner of the Best Mascara is Lancome Hypnose Waterproof Mascara and is also one of my personal all time favourites as it adds the most perfect volume. I’ve been using the Guerlain Terracotta Moisturising Bronzing Powder, winner of Best Bronzer and I can really see why it won as it is non-orange and really natural looking. Winner of Best Primer is Laura Mercier Foundation Primer and although it possibly isn’t my favourite it is a good one. As if to confirm that I really should try the Bare Minerals Original Foundation it won Best Mineral Base as is to be expected as it seems to be loved by everyone. Really excited to dig in and give them all a go since they are all winners! You can find the list os 103 products in this month’s Instyle Magazine’s Best Beauty Buys 2015 Supplement- would love to know if you end up trying some of the products which are all currently 10% off at John Lewis.